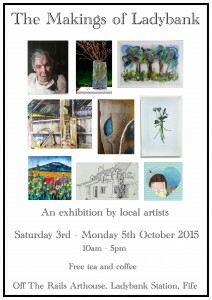 An exhibition of work by artists who live in Ladybank, or whose work is about Ladybank. Drawings, paintings, woodcarving, felt collage, ceramics and illustrations are on show. Poetry made by members of the Platform group in response to some of the artefacts, will also be exhibited. Tea, coffee and home baking on offer!